Talk about making the Bay Area proud. South San Francisco 2nd grader Matteo Lopez beat out more than 107,000 other kids to win the "Doodle 4 Google" competition. Lopez, 7, won a $15,000 college scholarship and a $25,000 technology grant for his school, Monte Verde Elementary in San Bruno. He also appeared on the Today Show. Best of all, Lopez's artwork will grace the front page of the Google website Friday. The theme of this year's contest was "What I'd like to do someday". The winner was selected by a group of judges, many of them are part of Google's "Doodlers" team. There were also 13 guest judges including "Garfield" creator Jim Davis, "SpongeBob SquarePants" producer Paul Tibbitt and children's author Beverly Cleary. 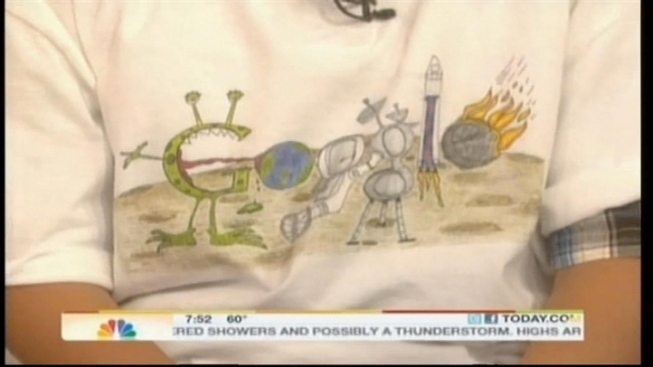 Lopez called his work "Space Life" and wrote in the description, "I want to wear a space suit, fly in space, walk on the moon and make friends with aliens (on) other planets."